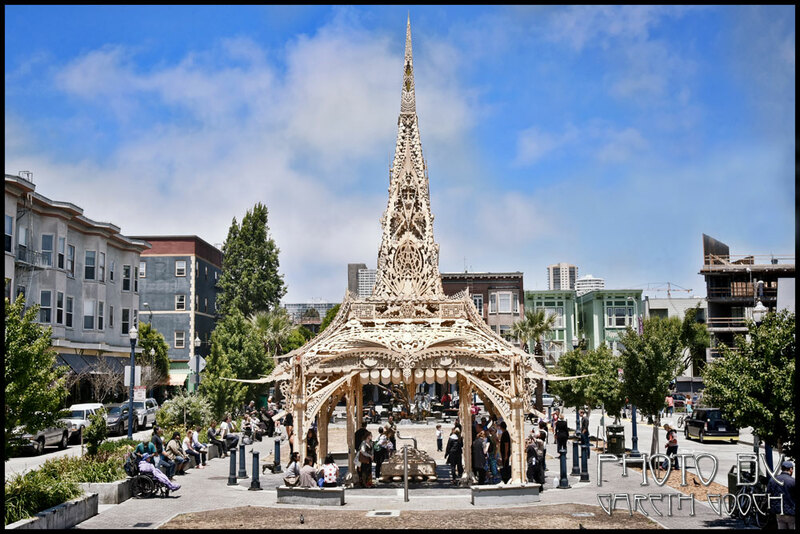 The San Francisco Arts Commission (SFAC) and Burning Man worked together to install The Temple at Patricia’s Green by renowned artist David Best in the Hayes Valley neighborhood of San Francisco, California, in June, 2015. Originally proposed by SFAC, and produced in close collaboration with Burning Man, the new temple commemorates the 10th anniversary of Best’s Hayes Valley Temple, exhibited at the same location — on Octavia Street at Linden Street — in 2005. In 2005, Mayor Gavin Newsom and the San Francisco Arts Commission encouraged the Black Rock Arts Foundation (now a subsidiary of Burning Man) to collaborate with the San Francisco’s Hayes Valley community and David Best to create an interactive “Temple.” The Hayes Valley Temple quickly became a cherished focal point for the community, providing a beautiful space that inspired connection, dialog and civic pride. It demonstrated how artists, city officials and community members can collaborate to create meaningful work specific to the needs of their community, and became the model for Burning Man’s Civic Arts Program. 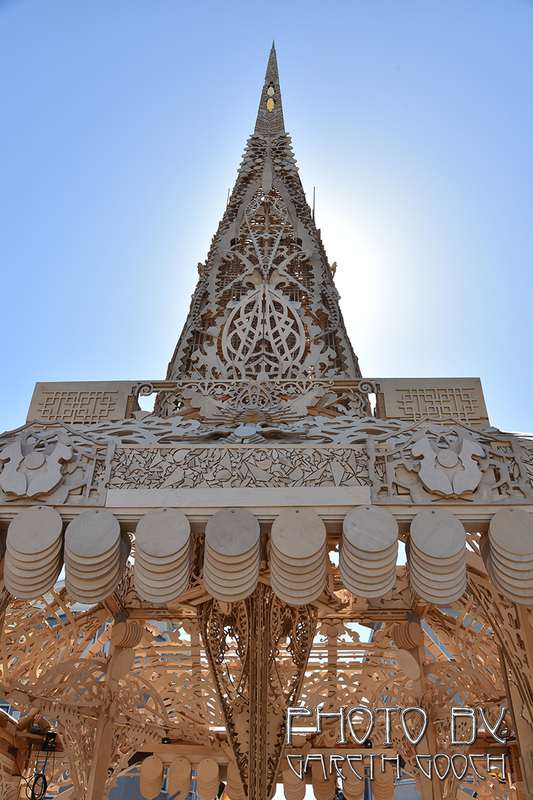 This temple celebrates the tenth anniversary of Burning Man’s Civic Arts projects and the successful revitalization of the Hayes Valley neighborhood. The Temple at Patricia’s Green is a participatory, interactive space that honors the loss of community members and celebrates the community’s dreams and aspirations for the future. Community members are welcome to write the names of, or messages to, lost loved ones, and/or their aspirations and thoughts on the temple’s walls. As people contribute to the piece, the space becomes a communal expression of very personal experiences, creating a new sense of affinity among participating community members. Patricia’s Green is located in the Hayes Valley neighborhood. 20 years ago, this neighborhood was one of the most blighted in the city. A portion of the elevated Central Freeway, closed and condemned after the Loma Prieta earthquake in 1989, once stood at the site of Patricia’s Green (the installation site in Hayes Valley) sheltering a myriad of illegal and dangerous activities. The destruction of the freeway and construction of Patricia’s Green public park brought new hope to the neighborhood. Patricia’s Green is now an active public park, where residents of extremely diverse backgrounds gather and coexist. On any given day, one can observe families, professionals taking breaks from work, children on school outings, seniors visiting from a nearby senior care facility, or art students drawing studies of the artworks, spending time in the park. A lively Opening Reception for the piece took place on June 26, 2015 and featured remarks by SFAC Director of Cultural Affairs Tom DeCaigny, City Board of Supervisors Board President and District 5 Supervisor London Breed, Burning Man Associate Director of Strategic Initiatives Tomas McCabe, Madeline Behrens-Brigham of the Hayes Valley Art Coalition, and artist David Best. Mauro ffortissimo of the Sunset Piano project warmed up the crowd with a few classical music selections, and lounge act Tom Jonesing concluded the morning’s festivities with the perfect soundtrack for a sunny, pleasant day in San Francisco.